The Mapex Storm Rock set is the best complete drum set perfect for the first time player needing a set with all of the hardware included. The all poplar Mapex Shells have the Mapex SONIClear bearing edge making tuning very simple and gives the drums plenty of tone. The 22" bass drum delivers a punchy low end. All of the hardware is double braced and along with the drums boast one of the best warranties in the business. 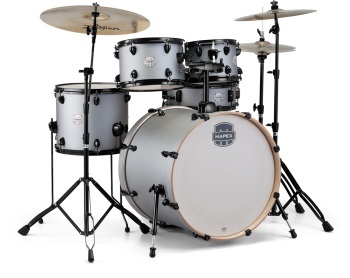 -The 5-Piece Rock Kit includes 10" and 12" bass-mounted rack toms, a 14" snare drum, and a 22" bass drum. The smaller and shallower rack toms make placement easier and overall set-up more comfortable while the large floor tom delivers a big sound. -Storm 22"x18"Bass Drum with Mount, 10"x7", 12"x8" Toms, 16"x14" Floor Tom, 14"x 5" Snare. Floor Tom Legs (x3), TH656, B400 Boom Stand, C400 Cymbal Stand, H400 Hi-Hat, S400 Snare Stand.